Popular media would have us assume that around 80% of the population are either a werewolf, vampire, ghost or zombie. Ah the blood sucking, immortal creatures that have been the subject of many different books and shows. In the elder days it was the young engaged couples travelling alone who really had to bother with this but thanks to the exploits of Dr Van Helsing, that variety of carnivorous fiend seems to be long gone. His little helper Igor chewing away on flies all by himself and disappearing back into the pages of Bram Stokers novel, mumbling about simpler times when a vampire master was in need of a lackey. Nowadays, it is with the young teen girls that we have to concern ourselves. Just when father’s across the globe had enough to worry about their daughter dating now there is this inexplicable influx of young heart throb vampires keen on the young girls (who only look their own age). So parents, lock your doors and bar your windows because that pale faced yet handsome little blighter, who moved next door and is only seen at night, may just be planning on making your daughter his eternal companion. TIP: Invite them for a dinner laced with garlic. Not Christian? Doesn’t matter, get those crosses up! Many cultures around the world have their own legend of the werewolf but we can get down to brass taxes and assume that we have adopted the Germanic folklore. In a time when all one had to do was stay out of the woods on a full moon to avoid werewolves, the half man and half dog could co exist quite peacefully (providing the predator was well fed on deer and elks). Nowadays, for three nights a month the rampant calling of werewolves can be heard from the city streets to the moors of England. Like the vampires the new breed of werewolf seems to have adopted a more boy band styled approach to his daily life. They may seem pleasant on the surface (a German Shepard dog can be too until it rips your face off) but they are essentially dangerous creatures, at least whilst the moon is high and fat. 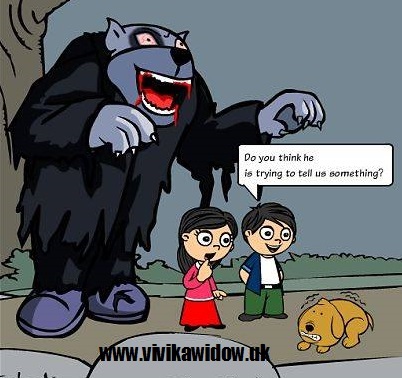 If your neighbour disappears for three nights a month or if you hear strange calling from their home it may very well be that they are a werewolf. This also means that a vampire could be lurking nearby because apparently after a tumultuous courtship the two now get on famously and there can’t be one without the other. TIP: Stock up on those silver bullets! (and a gun to shoot them would be helpful). Okay so these particular neighbours tend to be more nuisance house guests but all the more reason to be prepared for them. If you pass a little girl in eighteenth or nineteen century dress on your way to the bathroom during the night, then it may very well be your house is infested with ghosts. Most people make the mistake of calling the priest in for an emergency exorcism but going by past experience that just makes them mad. So unless they are rattling their chains and keeping you up all night or unless they continue throwing tantrums or playing peek a boo to the point of distraction just leave them be. They won’t really take up much room and its not like they’ll eat you out of house and home. Ghosts are nothing if not consistent. They seem to enjoy old fashioned costuming and that has changed very little over the years. You are still more likely to find a spirit of a Victorian Chambermaid than you are of Mrs. Prettin down the road who died just last week aged 92. Little kid ghosts can be the worst, especially if you have kids yourself. They will roll bright red balls up and down your corridors, sing creepy lullabies and follow you into every room. TIP: If they are being a true nuisance the best thing is to just accept defeat and move. That is what many people have to do. The end of time has been predicted by thousands of philosophers and holy men. The Mayans had their views. Nostradamus was certain of it. However, for some reason we seem to be at a huge risk of a zombie apocalypse. Maybe its all the nuclear material being passed around like a kids party or maybe its just that viruses are onto us. If it is a slipshod scientist dropping a vial in a laboratory or its a nuclear attack one thing will be certain… supplies will run out, all men will become gun toting action heroes and all women will be scantily clad and unable to function without said action hero (there are a few exceptions of course). So if there is a rise in the brain eating mutant beings it is likely you will be at most danger from your closest neighbour. Perhaps that is where it all began … Patient 0 if you will. To ensure you are effectively protected make sure your doors are closed over (zombies can’t function door knobs) and secure yourself in an upstairs room (zombies have trouble with stairs too). To prevent this you may want to keep a close eye on your neighbour. Do you see him/her scuttling about in a white lab coat at all hours of the night? Do you see strange packages being delivered at all hours of the day? if so there is a chance that you have a mad scientist in your midst and the chances are he already has a pet zombie. TIP: Aim for the head. Only really relevant if you live in Egypt, or close to a museum but lets face it these creatures have had centuries to wake up so its safe to say that they are in no hurry. TIP: Learn to read Hieroglyphics. So there you have it, my darlings. Those are my tips on what to do if your neighbour is a monster. Subscribe to the page for more updates, images and stories from Vivika Widow.